Wow. When this is all said and done, north of Reno will be a great urban district and south of Reno will be the textbook definition of suburbia. That Chevy lot is going to be a big key it seems. 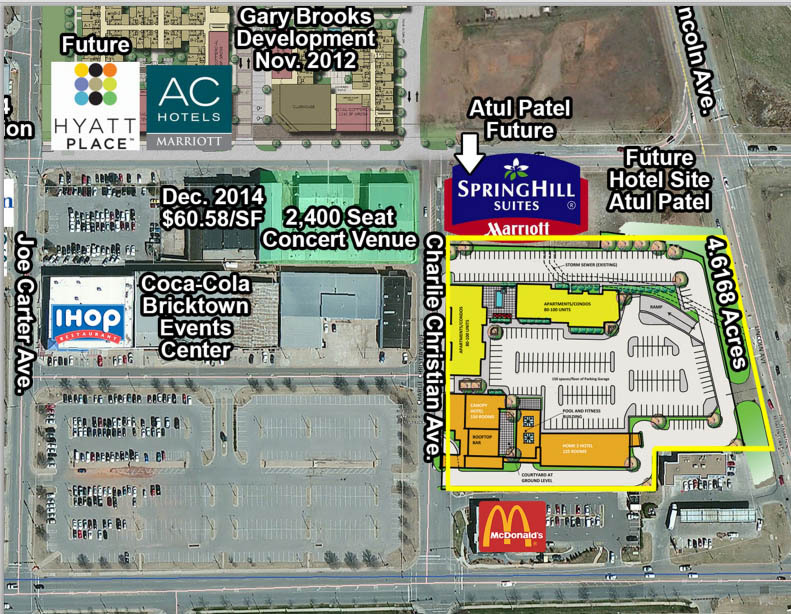 Great for east Bricktown but it will be interesting with the hotel situation. Especially with the 2 hotels with the steelyard development. I'd really love to see this property developed but 2 more hotels?? There are already 9 built or planned for Bricktown alone. Exactly my thoughts Pete. Nice apartments mixed with retail would be much preferred. Steve's had some great quotes from Patel and Mazaheri so it will be interesting to see what who the Canopy flagship go to. Mazaheri seems to think he can get it first or be more preferred for some reason. I don't believe Mr. Mazaheri has ever developed a hotel. Pete, remind me again who owns and what the plans are for the property just north of this? The property on the south side of Sheridan, just west of Lincoln is what I am referring to. Why not some for sale housing? I'd be waiting to see if we've hit the saturation point on rental apartments as well as hotels. The demand for for sale housing is likely there as the young people living in rentals age and start having children. The Hill and the new Civic Center housing are currently the only for sale housing, although 3 lots in Maywood just went on the market. I hope this doesn't derail the proposed Canopy project, which is badly needed infill in the core of Bricktown. That said, it will be great to see another eyesore gone and replaced with (hopefully) a quality development. The demand for for sale housing is likely there as the young people living in rentals age and start having children. The Hill and the new Civic Center housing are currently the only for sale housing, although 3 lots in Maywood just went on the market. If that's your target demo, the prices of for sale would need to drop pretty significantly and I don't see that happening. Even stuff in Mesta Park and Gatewood is pretty out of range for that demo. Sure there are some here that live in those places, but why do you think Classen-Ten-Penn is taking off? Young people can actually afford those. If this gets built I hope the parking garage allows for the surface parking in front of Chevy & at Bass Pro to be developed. Remember when we were discussing the poorly conceived site plan for the Staybridge Suites east of here, and this parcel was brought up by the anti-urbanist as to why the Staybridge project shouldn't have to comply with urban design principles. Funny how that works. Damn, look at all that surface parking in Lower Bricktown. I can't remember a single person arguing FOR the staybridge suites site plan. It's mindnumbing isn't it? Even if Randy Hogan wanted to use surface parking, what made him think it was the best use for canal-front real estate? As a group perhaps yes, but there are definitely young families who can afford downtown prices. Probably a quarter of the brownstone owners now are under 40. There are young families in Heritage Hills and Mesta Park as well. There may be families with older children who would consider living downtown as well, now that the idea doesn't seem as revolutionary as it did 8-10 years ago. I think it's great that some are choosing Classen Ten Penn though. It's going to end up a great close-in neighborhood. Just look for any comment from the usual suspects. Hmmm, i know hes working on this but it seems like hes just sitting on the BoA drive thru....has there been any words about plans for it in a while? When I talked to Mr. Mazaheri right after that purchase, he was very vague about his plans. Not elusive at all, more like he wasn't really sure what he wanted to do on the site. When you look at the revenue generating portion of Bricktown compared to the non-revenue portion it is staggering to think how far the area has to go. Most of what people consider the urbanized portion of Bricktown would fit in the Chevy Event Center surface parking lot. Honestly, comments like this from the developer have me a little concerned but it shows a basic misunderstanding of what is trying to be accomplished in Bricktown. Given the choice between building on a small piece of land or spreading that same hotel out on 4.6 acres then I vote for small piece of land. His comment was not a selling point for me. He's not talking about a hotel on 4.6 acres. He's talking about condos, a parking garage and another hotel as well. This should change the way you think about it if he does all he says he will do. I totally get that and this project seems like it will fit within the vision many of us have for Bricktown. I just took it to mean that they were specifically talking about the Canopy hotel portions of each development. Once a site plan is made available we can see exactly what it going to look like from a land-use perspective. I'll wait until then to bring the subject up again. I would rather see the Canopy hotel in the heart of Bricktown where originally proposed. There it would be great infill and in my opinion would be far more impressive at street level and to visitors than it would be out on the edge of the district. I like the rest of what is planned for the Bodyworks site however. It will be great to see an eyesore replaced with a mixed use development. I would rather see the Canopy hotel in the heart of Bricktown where originally proposed. There it would be great infill and in my opinion would be far more impressive at street level and to visitors than it would be out on the edge of the district.